One of the most common knee injuries in sport is a sprain or tear of the Anterior Cruciate Ligament (ACL). ACL injuries are typically caused by a sudden change in direction, rapid deceleration, incorrect landing following a jump, pivoting, or a direct impact, as would be the case with a football tackle. Recovery from any ligament injury is a slow process and the ACL is no exception – it can take as much as six to nine months before it is possible to return to previous levels of activity. As an exercise professional working with sports participants, an understanding of how the ACL functions, including the preventative measures to limit the injury risks is essential. What is the ACL and where is it located? The knee is formed by the interaction of three bones: the femur, the tibia and the patella. These bones are connected by four ligaments; two collateral ligaments found on each side of the knee joint and the posterior and the anterior cruciate ligaments (ACL) found inside the knee. The anterior and posterior cruciate ligaments, which cross inside the knee joint, connect the front of the tibia to the back of the femur, and the back of the tibia to the front of the femur respectively. Together, these ligaments connect the bones in the upper leg with those in the lower leg, controlling movement and keeping the knee stable. The ACL provides rotational stability and helps to prevent excessive forward movement of the tibia in relation the femur – it also assists with the prevention of hyperextension at the knee. ACL injuries are most common in sports that involve high levels of impact like football, basketball and rugby, especially when this is coupled with high levels of directional changes made at speed. Racquet sports like squash, badminton and tennis are also highly correlated with ACL injuries. Given that the function of the ACL is to maintain the integrity of the knee joint, and because it essentially serves to resist the sheer forces imposed on the knee during jumping, landing and twisting movements, any sport that incorporates these actions has the potential to injure the ACL. American studies have shown that 70% of ACL injuries are non-contact, such as landing at a strange angle or decelerating suddenly, with just 30% happening as a result of contact with another player. Several studies have also shown that women may be more predisposed to ACL injuries than men, with differences in physical conditioning, muscular strength, hormonal changes and anatomical differences (e.g. such as women having a wider pelvis and a higher tendency to suffer from “knock knees”) being suggested as reasons for this. Given that the majority of ACL injuries are not caused by person-to-person contact, it stands to reason that an individual has a certain amount of control and influence in preventing these injuries from occurring. One of the best ways to protect the knees is to develop good body awareness and learn to create quality movement within the joints’ natural limitations. Repetition of key sporting actions, especially those which require directional changes can help to increase the strength of the ACL, thereby affording greater knee stability. Emphasis should always be placed however on movement quality and not quantity – similarly, the speed at which these drills are performed should initially be slow and only increased when proficiency has been demonstrated. The use of proprioceptive drills, particularly those that improve the knee’s ability to withstand anterior sheer forces while landing are also extremely common and particularly effective in ACL prehabilitation programmes. Forward and backwards jumping movements, including box drops, box jumps and depth jumps are among the most common activities used to improve the strength and function of the ALC by strength and conditioning professionals. Ankle, hip and core stability also play a crucial role in reducing the risk of ACL injuries to some extent because the knee and dependent on stability in these areas in order for it to be able to perform its functional role. Instability below from the ankle, or above from the hip and/or core, will place more demand on the knee’s stabilising structures, of which the ACL plays an important role. While it is beyond the scope of this article to describe any specific techniques to improve stability in these areas, it is important to remember that a balanced and whole-body approach is always the best conditioning strategy. Placing too much focus on any one bodily area, muscle or group of muscles is only likely to create further imbalance elsewhere in the body, increasing the potential for future injury. Plyometric training is an advanced conditioning technique that is used in strength and conditioning programmes to improve the explosive strength and power capabilities of muscles, particularly in the lower body. Many lower body plyometric activities (tuck jumps, bounding, hurdle drills, squat jumps, box jumps etc) place a significant amount of stress on the ACL and as such can help to increase its strength. In most cases however, these drills place more stress on the ACL than it is capable of withstanding and typically cause more ACL injuries than they prevent, especially in non-athlete populations. Plyometric training should only be used by extremely well-conditioned individuals and many authorities argue that lower body plyometrics should not be attempted unless the participant is capable of squatting 1.5-2.0 times their own bodyweight. By this standard, a 70kg female should be able to squat a minimum of 105kg for 1 repetition before they are able to perform plyometric training safely. For this reason the use of plyometric training with those at risk of, or recovering from ACL injuries should be carefully scrutinised. What are the main symptoms of an ACL injury? The symptoms on an ACL injury will vary considerably depending on the nature and extent of the trauma. For example, in cases of microtrauma (overuse injury), there may be no obvious symptoms other than pain across the front and middle of the knee area. With a macrotrauma (sudden episode of overload) however, like a rupture of the ACL, the symptoms are likely to be more pronounced and may include a combination of sharp and sudden pain, an audible popping sound. Swelling and stiffness in the period immediately following the trauma, discomfort while walking, loss of joint motion and tenderness are also commonplace. Grade 1 – an ACL tear in which only a small number of fibres have been damaged/torn. 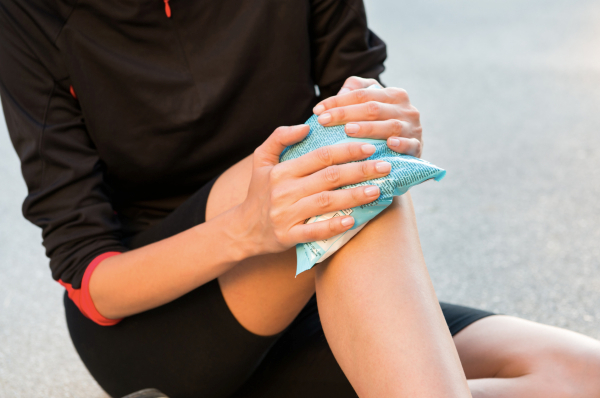 Some pain is usually present but the knee will normally continue to function. Grade 2 – an ACL tear in which a significant number of ligamentous fibres have been torn. A considerable amount of pain, discomfort and swelling is typical and as such the knee also loses much of its function. Grade 3 – a complete ACL rupture in which the ligament is completely torn or where it becomes detached from its bony connection. A complete loss of function is likely and surgery will almost always be required. What are the main forms of treatment? Treatments will vary from one case to the next because around half of all ACL tears occur in combination with damage to other joint structures, including the meniscus, cartilage and/or other ligaments. The specific treatment plan will therefore depend on the individual circumstances. What are the best ways to get back into training? The process of returning to exercise or activity following an ACL tear is much the same as any other soft tissue injury, and can often be frustrating for those with injury. The stages of tissue healing (inflammation phase, repair phase and remodelling phase) must be adhered to and it’s essential to remember that this process cannot be rushed. Additionally, activity should only commence once clearance has been given by a suitably qualified physical therapist.